Aboriginal Affairs David Zimmer.M¨¦tis Nation of Ontario (MNO) citizens, including M¨¦tis youth, are sharing their knowledge and talents during the Pan AM Games Aboriginal Pavilion by entertaining and teaching festival attendees about their M¨¦tis heritage. The Aboriginal Pavilion takes place in two different sets of dates. ?The first set coincides with the 2015 Pan AM Games from July 10 to July 26 and the second set of dates goes from August 7 to August 9, during the Parapan AM Games. The MNO is one of the Aboriginal partners for the Pan AM and Parapan AM Games. opening night. Night Showcase as the MNO representative and gave greetings on behalf of MNO President Gary Lipinski. During the Opening Night Showcase, MNO citizen, musician and composer Jamie Dupuis was one of the artists invited to perform. Dupuis, a talented guitarist, played the harp guitar wearing his M¨¦tis sash with a M¨¦tis flag patch sewn on. 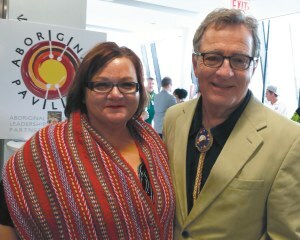 Vice-Chair McBride also visited other Aboriginal Pavilion locations, including the MNO booth. The booth is staffed by students in the MNO Summer Youth Cultural Program (SYCP). Throughout the festival¡¯s duration, the students are located at the M¨¦tis camp at the Fort York National Historic Site. The MNO booth recreates a traditional encampment from the fur trade era, with a canoe and even a campfire, with the students dressed in traditional M¨¦tis clothing. The MNO SYCP students interact with visitors, teaching them about M¨¦tis culture, finger weaving, dot art and M¨¦tis beadwork. The M¨¦tis skills the students teach were all learned during their training for the MNO SYCP back in May, allowing the students to knowledgeably explain the M¨¦tis artifacts displayed at the camp, as well as the M¨¦tis timeline, to educate visitors about their history. Children visiting the camp are invited to colour pictures of M¨¦tis sashes or the M¨¦tis flag and learn about their meaning. Rain or shine, the Aboriginal Pavilion activities are scheduled daily and the MNO booth at the Fort York National Historic Site from 11:00 a.m. to 9:00 p.m. The schedule for all of the events is posted on the Aboriginal Pavilion¡¯s website.